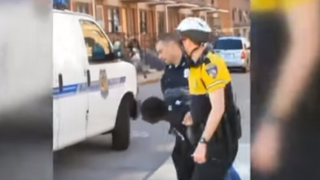 Cellphone video captures Freddie Gray’s arrest by Baltimore police April 12, 2015. Thousands of people, including the Rev. Jesse Jackson and Rep. Elijah Cummings (D-Md. ), attended the funeral of Freddie Gray at the New Shiloh Baptist Church in Baltimore on Monday, USA Today reports. Senior members of the Obama administration were also expected to attend, CNN reports, including officials who manage the White House’s outreach to the public and the administration’s efforts to support working-class men. The White House was sending Cabinet Secretary Broderick Johnson, chair of the My Brother’s Keeper initiative; Elias Alcantara, an official from the White House Office of Intergovernmental Affairs; and Heather Foster, an adviser from the White House Office of Public Engagement, according to CNN. Protesters marched in Baltimore Saturday to bring attention to the suspicious and fatal chain of events surrounding 25-year-old Gray’s arrest by Baltimore police on April 12. It’s suspected that Gray incurred a severe spinal cord injury during his ride to a police precinct. It has been reported that Gray requested and was denied emergency medical care before dying a week later in a Baltimore hospital. According to Gray’s family, Gray’s voice box “was crushed,” CNN reports, and his neck was snapped before he left the police van—injuries that his family says occurred before he entered a coma. Relatives of Eric Garner—who died in July 2014 after being placed in an apparent choke hold by a New York City police officer—and of Amadou Diallo, who was shot dozens of times by New York City police in 1999, are also attending the funeral, according to CNN. Gray can be seen on cellphone video screaming and being dragged by police during his detainment. According to CNN, Baltimore Police Commissioner Anthony Batts weighed in on the matter, expressing concern over why Gray was not properly secured in the police van on the way to the precinct and why he was not given emergency care. Read more at USA Today and CNN.